The next book up for discussion in the Ladies Book Club at Old Palm Golf Club is âDiane von Furstenberg: A Life Unwrapped,â a biography of one of the legends of 20th-century fashion. 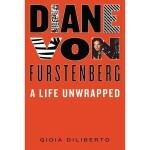 The book by Gioia Diliberto is a real page-turner based on countless interviews with von Furstenbergâs family and friends and the designer herself. The daughter of a Holocaust survivor and wife of an Austrian nobleman, von Furstenberg vaulted to the top of New Yorkâs fashion scene with the introduction of her famed wrap dress. It soon became a symbol of womenâs liberation, youth and independence. The author elaborates on how von Furstenberg rose to the top of the fashion world in the decadent seventies and glamorous eighties. However, there were plenty of failures, both personal and professional, to go along with the designerâs huge success and stunning comeback in the nineties. Now 68, von Furstenberg is a legend, and this book shows why in fascinating detail. The Ladies Book Club will meet to discuss it on December 16, 4:00 p.m. in the Ladies Lounge.